As the year kicks into gear, the tension between planning and doing can leave us feeling a little torn. For many of us planning can feel exacting and tedious. The desire to just get on with things can present an overpowering and irresistible urge. Planning can seem like its bogging us down, chaining us to the desk or holding us hostage to long boring meetings when the real action is out there building stuff, creating things, interacting with clients or working with our colleagues and students. Herein lies trap #1 – JUST DO IT: We decide this planning stuff is just too dull, too difficult, too dry and decide taking action is best. So we dive in headfirst. The problem is we failed to read the sign that said “caution, shallow water and dangerous rocks”. Plain and simple, the time spent planning up front saves us that big headache down the track. Yet herein lies trap #2 – PLAN THEN DO: This time we did read the sign. We decide to sit back and do the planning. We get together, we brainstorm, we talk. We’re all aligned at the start of the year. Then we tick the box, file the plan and get on with things. In spite of our best intentions, all the rara and inspirational talk, we default straight back to doing. Consumed with immediate and apparently urgent demands, we quickly become the hostage of reactivity, short-term focus and largely tactical activity. 1) JUST DO – The analogy I like to draw here is that its akin to being stuck in our reptilian brain, working on autopilot, mindlessly getting on with things, ticking boxes and largely getting nowhere. 2) PLAN THEN DO – While our intentions are good and we aim to move into a state of more focussed activity, we ultimately get pulled back into just reacting to things. Symbolically, it’s the emotive limbic system that’s in the drivers seat here, pulling us left and right, lurching us here and there depending on who’s demanding most or screaming loudest. The missing link in the planning cycle is REFLECTION. It is in the state of reflection where we can more fully tap into a space where we can sit with a concept, objective or challenge. This is the space where our higher order capabilities of creativity, abstract thinking and problem solving can kick into gear. It’s akin to our human brain, the cortex, which when active, enables us to come up with new ideas, draw connections, make decisions and find clarity. The mindfulness that comes with regular reflection cultivates skilful self-regulation and focussed action rather than unthinking reactivity. Perhaps its time to change the cycle? 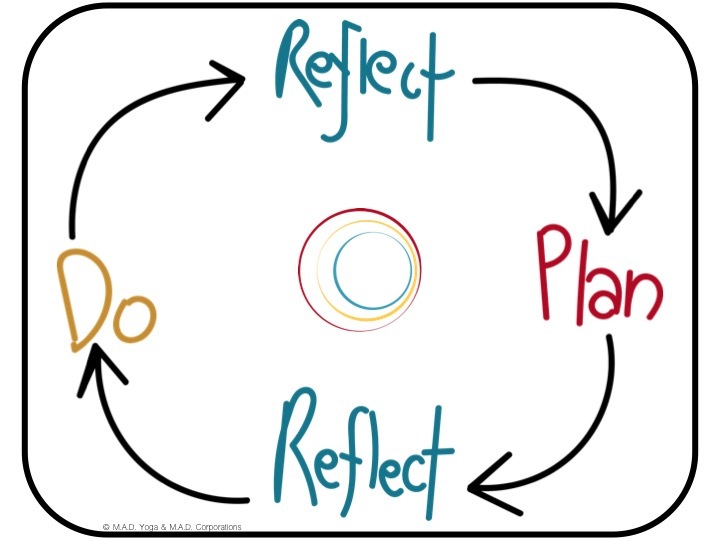 Injecting a regular practice of focussed reflection into the cycle of planning and doing will help keep our plans alive and turn them into a dynamic guide that keeps us on track. Like a lighthouse, it is the beacon on the hill, always there guiding the way, keeping us calm and focussed no matter how stormy, rough and rocky the waters get. https://www.madmindworks.com/wp-content/uploads/2016/02/grey-logo-mad-mindworks.png 0 0 Katherine Mair https://www.madmindworks.com/wp-content/uploads/2016/02/grey-logo-mad-mindworks.png Katherine Mair2016-01-14 21:27:382016-01-14 21:48:30Change the Cycle. Start Now. I’m Not Busy.